A phylogeny of vertebrates I made as a study guide for my peers in Vertebrate Paleobiology. Information compiled by Drs. Thomas Holtz and John Merck, but any errors are probably mine. Taxa in bold have extant representatives. Taxa for which monophyly is uncertain are followed by a question mark. Taxa whose phylogenetic position is less certain than presented here are preceded by a big orange question mark (this excludes those whose uncertainty is already indicated by a polytomy). In the lower right is a short list of taxa so problematic that we did not deign to place them in even a tentative position on the phylogeny (though we may have ideas about what major groups they belong to). This should not be by any means treated as an exhaustive list of controversies in vertebrate phylogenetics, as I have only indicated those we brought up in class. All silhouettes are from PhyloPic, with the exception of the parvicursorine, which was generously made for me by when I lamented that I could not find any alvarezsaurid silhouettes on PhyloPic that were satisfactorily fluffy. Due to the time and effort involved in creating an image of this size and nature, I am unlikely to update this on a regular basis. As such, this should be considered a snapshot of the state of the art and will inevitably become increasingly outdated as time goes on. However, a more up to date version including only the branching topology (but not the synapomorphy lists or silhouettes) is available here. No clarity on their phylogenetic position yet to my knowledge. I have some recollection of a recent conference abstract suggesting they are stem-perissodactyls, but don't remember where I found it. Aren't paucituberculates sister to australidelphians? Traditional Ameridelphia is no longer considered to be monophyletic (see e.g. : Nilsson et al., 2010). The position of sparassodonts within Metatheria is uncertain. I never said ameridelphians were monophyletic. I said paucituberculates were sister to australidelphians, leaving didelphimorphs outside. Sorry, I misread. The relationships between paucituberculates, didelphimorphs, and australidelphians are unclear. In old topologies where caseids & varanopids were closer to each other than to ophiacodontids or therapsids, was Caseasauria ever used to include varanopids? I need to know for an April Fools joke I'm planning. 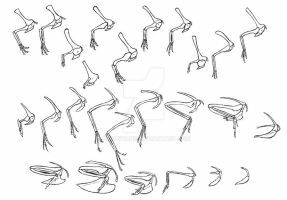 What specific positions have been proposed for erpetosuchids? Their Wikipedia article gives you an idea. Do thalattosaurs not have a euryapsid skull? Ancestrally they did, but the supratemporal fenestrae were greatly reduced, and in many cases were lost. Here we used Euryapsida for ichthyosaurs + sauropterygians, regardless of anatomical condition. Is the old Enaliosauria available for thalattosaurs + euryapsids? It's traditionally used equivalent to our Euryapsida, but if someone wanted to define it that way, perhaps. Shouldn't ursoids & musteloids switch places? We were probably following the older, morphology-based topology for that one. Since when are anthracotheriids ruminantimorphs? Since whichever study Holtz followed while preparing for this class. I'm aware they appear to be cetancodonts now. I'm not particularly familiar with mammals (and I'm guessing you aren't either), but how would you rank these traditional ideas in order of likelihood? 2. Bats sister to colugos within Archonta. 3. Pangolins sister to xenarthrans, with this clade close to Euarchontoglires. 4. Afrotheres close to laurasiatheres. 9. Artiodactyls closest to carnivorans & perissodactyls closest to afrotheres. 10. 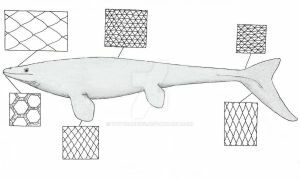 Monophyly of noncetacean artiodactyls. Keeping in mind my modest knowledge of mammals, I don't consider any of these ideas to have a significant chance of coming back. Maybe traditional Insectivora and Archonta (but not including a bat + colugo clade) because of the number of morphological characters supporting them, though I wouldn't bet on it. What do you think of Vislobokova's attempt to discredit cetancodont synapomorphies? I also remember that orangutans, gorillas & chimps were once thought to form a clade exclusive of man. Is that dead in the water as well? Again keeping in mind that this is not my area of expertise, I don't put much stock in non-monophyly of Cetancodonta. So far as I can tell, the paper's main argument for it is to say that the synapomorphies uniting the clade are "weak" with little explanation, nor does it contain a phylogenetic analysis of its own to test its conclusion. It is true that there appears to be a lot of homoplasy in that part of the tree that confounds resolution, but the basic tenet of whales being artiodactyls (and closely related to hippos) is found nearly unanimously by recent analyses. My judgment is that Cetancodonta is almost certainly closer to the truth than whales being sister group to all other artiodactyls. Humans being sister to all other great apes is long dead and fell out of favor even prior to molecular phylogenetic studies. When you say "not including a bat + colugo clade", do you mean that bats are definitely outside colugos + primates? Or do you mean that a bat + colugo clade could exist but would be outside Archonta? How strong is the evidence against a pangolin + xenarthran clade (regardless of where that hypothetical clade goes)? I meant that bats are likely outside of colugos + primates. Even most morphological analyses recover that result. Luckily for you, I wrote a term paper on xenarthrans this past semester, so I can tell you that while some phylogenetic analyses in the 1990s and early 2000s found pangolins and xenarthrans as sister groups, almost all their proposed synapomorphies can easily be explained as a result of convergence on a myrmecophagous lifestyle. Automatically dismissing functionally related characters as convergent? Tsk tsk (unless I'm missing something and the pangolin + carnivoran clade resulted from more than one study). Do any morphological analyses find Laurasiatheria? To add to what I've said previously: O'Leary et al. (2013) did not find any characters that directly contradict pangolins and carnivorans as extant sister groups. While you are correct that it is fallacious to assume convergence just because we may expect it to be present, the fact that the synapomorphies (both molecular and morphological) that have been identified for a pangolin + carnivoran clade are not so readily attributed to ecological or behavioral similarities makes me strongly suspect that in this case we are seeing convergent characters swamping out the actual signal in morphology-only trees. Almost all reasonably comprehensive molecular studies find Ostentoria to my knowledge (but they sometimes call it Ferae). I am not aware of any morphology-only analyses that have recovered Laurasiatheria. How much has amniote phylogeny changed since Gauthier & colleagues made this diagram in the 80s? I know Ornithosuchia is no longer used that way, but what else is new? Gorgonopsians are now considered closer to mammals than are dicynodonts. Diademodon and Exaeretodon would be sister groups rather than successively closer to the crown group in newer analyses. Casea might be closer to mammals than Ophiacodon is. Captorhinids as sister group to turtles has fallen out of favor. Non-archosauriform archosauromorphs are badly in need of an update, but the latest topology is very different, with choristoderes, protorosaurs, Trilophosaurus, and rhynchosaurs successively closer to archosaurs in that order. I do have. What I do not have is permission to distribute them. Which lectures are you looking for specifically? I may be able to provide summarized notes (but I'm making no promises). I was looking for the archosaur & placental lectures (the bird lecture doesn't seem to even have a page). Sorry if I'm being a bother. WOW this is an impressively large cladogram! Congrats on completing such a monstrosity. The best part is it's overall aesthetic simplicity--keeps everything clear to see despite how much information is packed in there. However, I thought pantestudines is now generally considered to be a sister group to archosauria--can you weigh in on that? Are those new findings more controversial than I've been led to believe? Thank you! Turtles consistently result as sister to Archosauria in molecular analyses, but only in molecular analyses. Morphological analyses including stem-turtles like Eunotosaurus (which, naturally, are not subject to molecular analysis) almost always find them elsewhere. The notes for our turtle lecture are available online for perusal, if you are interested in reading more detail about our take on turtle origins. Well that's quite a headache. Haha I had assumed the positioning of turtles within parareptilila was an outdated idea based on superficial anatomical characteristics, and that this was overturned with the use of molecular data. I hadn't realized the depth of the morphological support...I find it hard to believe that a clade of organisms could become "molecularly convergent," but something does seem really off here. :/ Thanks for the link! It was very informative. We are, in fact, aware of multiple examples of molecular convergence, such as genes associated with echolocation in bats and toothed whales and genes involved in venom production in platypuses and squamates. Given the amount of time that has passed since the potential split between turtles and archosaurs, I would not reject the possibility of genomic convergence. Wow, fascinating papers! Had no idea genomic convergence was a thing--I've never heard about it before. Still seems like it would be an abnormally large amount of genomic convergence in the case of turtles and archosaurs, but certainly very possible. Would you look at that: Pappochelys provides some fossil evidence for a diapsid origin of turtles! Whether or not they turn out to be close to archosaurs remains to be seen. Oh yeah, I saw this on Tom Holtz's facebook! I was happy that the morphological and molecular data were agreeing on something for once--hopefully it will get us closer to the answer on this subject. Finally found a big version. Are creodonts still monophyletic? Still an open question to my knowledge. Why isn't this course on Tom's website? Damn. How long did this take? It was done in three parts (I updated it before each exam) and each time it took the better part of 1-2 days, so the inexact but inarguable answer is: many hours! Wow, outstanding work . Such dedication. Is it supposed to be this blurry? No, but I don't think I can do anything on my end to help with that, unfortunately.